Despite playing the sulky kid until recently in regards to placing its titles on Android Market, Gameloft is undoubtedly one of the best mobile game developers out there. It just revealed a trailer for one of its first games with the Unreal engine graphics technology, and said it will be available for both Android and iOS. 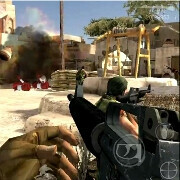 The game is called March of Heroes and is (obviously) a first-person shooter, everyone's favorite genre. The graphics are breathtaking, we have to admit, so we can't wait for this title to hit the application stores. When exactly will March of Heroes be released, and how much it will cost are minor details that Gameloft didn't consider necessary to tell us. Have a look at Gameloft's official March of Heroes trailer in the video below. Too bad there are virtually no games in the South African App store! Hmm. Will it a) be updated in the Android Market, b) work on my DROID X, and c) not have a million hackers in multiplayer? Only time will tell. If your going to buy a gameloft game, don't buy it from the android market first of all, buy it from their web site. There games are always cheaper on the web site and they usually have some type of promotion. By the way Sniggly, I have modern combat 2 on my epic and the online multi player isn't even worth playing do to all of the hackers. I seriously can't stand them and have no idea what they think is so great about it. If I ever met someone who hacked into games and created all the issues that they do, I would punch them square in the nose, then the baby maker so they could never reproduce! Yeah, I was referring to the hackers in MC2. I mean, it's funny to give the speed hackers a shotgun blast to the face, but the wall hackers absolutely ruin capture the flag, and sometimes make it unwinnable for both teams when they drop the flag outside the map and don't recover it. Yeah I hate the speed hackers, although usually I can beat them unless we're playing capture the flag. There's actually no "wall hackers", it's just a bug in the game.